The Hotel Luxor , recently renovated, is also open in winter during the weekends. It has a large swimming pool with solarium, parking and free WI-FI connection throughout the entire hotel. The kitchen offers meat and fish menus and special dishes for intolerant and celiac people. Small pets are allowed with supplement. 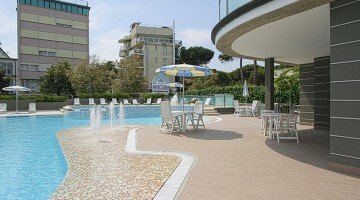 The hotel is 20 meters from the pedestrian area of Milano Marittima in the city center, 2 minutes walk from the beach. Thanks to the restyling 2018, the hotel has expanded and rebuilt rooms, all with balconies, independent air conditioning / heating, WI-FI, safe, direct telephone, LCD TV with Sky (from May to September), private bathroom with box shower, hairdryer and cosmetic mirror. COMFORT : rooms of 14-15 sqm large and functional. On request it is possible to communicate these solutions. DELUXE : rooms of 15-20 sqm of the latest renovation (year 2018) comfortable, elegant and quiet. 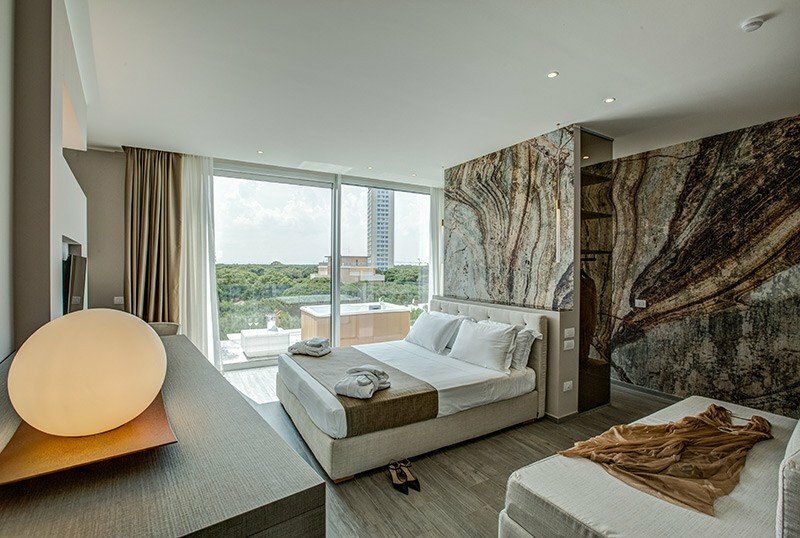 JUNIOR SUITES : two panoramic suites located on the top floor. Swimming pool located 150 meters from the hotel, adjacent to the beach, with hydromassage area and waterfall for cervical massage, garden, reading room with newspapers, night porter, 2 lifts, bar, theme nights, evening activities and guided tours, reserved discount at bike hire nearby. For a fee: massages, laundry service. PARKING : at a cost of € 5 per day inside the courtyard until all seats (in this case you need to leave your keys) or in a new parking agreement at 1 km from the hotel; on the street, free of charge, thanks to the release of a special pass issued with a deposit of € 50, fully returned upon departure. The parking lots are not guarded. WI-FI : with 100 Mega fiber in the whole structure. AIR CONDITIONING : in the common areas and rooms. AGREEMENTS : beach, theme parks, discos, gyms. SERVICES FOR DISABLED PEOPLE: entrance located on the ground floor, standard lift, room with wheelchair access, shower with wheelchair access, shower chair. PETS : small pets allowed with supplement. A dog sitter is available upon request. BREAKFAST : sweet and savory buffet with croissants, homemade desserts, cheeses, cold cuts, yogurt, cereals and fruit juices. Also served in the garden. LUNCH AND DINNER : 4 choice menu of meat and fish with pasta and homemade desserts, salad buffet, vegetables, appetizers. VARIATIONS : vegetarian and vegan cuisine, the kitchen prepares dishes and menus for celiacs. In the hotel : swimming pool for children, entertainment after meals, baby / mini club, babysitting service and paid pediatrician. In the room : cribs, baby baths, sides. At meals : kitchenette available, high chairs, baby food and baby menu. On the beach : games, tournaments and creative workshops. Guests have access to an outdoor swimming pool, located 150 meters from the hotel and with direct access to the beach. The pool is 900 square meters wide and has a fountain for cervical massage, a hydromassage area, a basin with shallow water for the little ones, a rescue service and vaporizers. Reserved poolside loungers and free non-alcoholic drinks are available by the pool. Do you dream of a summer holiday that combines convenience and style? At Luxor we have the solution for you. During the Summer, we offer 3 special weeks in full board.